There are very few sequel books in a series which are better than their predecessor. 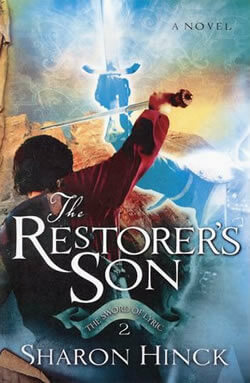 Restorer’s Son, by Sharon Hinck, is one of these books. My opinion of the first book in the Sword of Lyric series, The Restorer, was average at best. Thankfully, the second book in the series more than evens the score out. Restorer’s Son continues the story of The Restorer, following Jake, who has disappeared into Lyric, and Susan and Mark, his parents, who find themselves back in Lyric only an hour after the conclusion of their last adventure, trying to find Jake. We also get to follow Kieran, the new Restorer, who is unwilling to recognize his new powers and connection to the One. Things start to go crazy when Kieran hears the One tell him to take the Verses to Hazor, arch-enemies of the People of the Verses. What sets this book apart from the first is the story itself. Frankly, I think that Sharon Hinck’s characters in the world of Lyric are much more complex and engaging than the characters she sends in from our world, who smell faintly of Narnia rip-offs. In this book, the character of Kieran is incredible. He’s Lyric’s equivalent of Paul, and he’s just as intriguing as he was in the first book. Better, we’re introduced to his past, his connections to Hazor, and just how all of that culminates in his role as the Restorer. It’s just hard to fathom how such a good character and story can be meshed with a distinctly average supporting cast. The characters from our world are almost as disappointing as in the last book. Jake has no personality, no actions of his own, and seems to serve as a convenient sideshow to get Mark and Susan back into Lyric again. This turns out to be a good thing though, as we get lots of chapters from Kieran’s story without much of Jake’s interrupting things. And the book ends on a high note (spoilers ahead): Jake finds he has the Restorer powers, and Cameron, chief council-member of Lyric with dubious intentions, is loose in our world. If you read The Restorer and enjoyed it, you’ll definitely enjoy Restorer’s Son. It builds on the series, improves it in many ways, and is overall just an excellent read. If you haven’t read the series, you might be able to power through The Restorer in order to get to Restorer’s Son, but don’t count on it. Personally, I’m looking forward to book three and seeing how the entire story winds down. 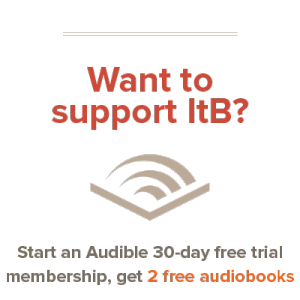 This is an email update from Into the Book. Contact us Here. Or, like our Facebook Page.